Crowds turned out to watch Fife Provost Jim Leishman welcome the showmen back to the esplanade for their annual visit and declare the Market open. Kirkcaldy Links Market is open for another year. “This is the longest fair in Europe and the second biggest attended function in the whole of Fife, attracting well over 100,000 people each year,” the Provost explained, saying it was only surpassed by the St Andrews Open Golf Championship. Philip Paris, the new president of the Showmen’s Guild of Great Britain, said he was very proud to be the first national president of the guild in over 60 years to be a Scotsman. “I hope that everyone has a very happy and safe Links Market,” he added. 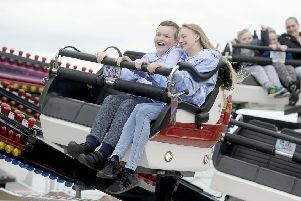 Over 120,000 visitors are expected to attend over the six day event, and because Fife’s schools are still on holiday the numbers could be even bigger than usual. The weather stayed cold but dry for the opening, and is forecast to get warmer as the week goes on, although rain is predicted for the last day on Monday. Katelyn Brand (5) and Caleigh McQuade (11) from Dunnikier Primary presented flowers to the Provost before joining him for a ride on the dodgems. Local councillors as well as David Torrance MSP and other invited guests then took a walk along the fairground, meeting and greeting members of the public.